[ George Pearson, English film director. ] Christmas Card, with Signed Autograph inscription to his pupil the set designer 'Edward Carrick' (Edward Craig), with copy of his 'Photographic Journal' article 'The Film in Colonial Development'. Christmas card dated 1970. Photographic Journal article, August 1948. ONE: Christmas card. 12mo bifolium, with coloured illustration of Christmas candle on cover. Pearson writes: 'FOR [corrected from 'from'] | Edward. A. Carrick | from his old inspirer | George Pearson | 1970'. The association between the two men was warm. [ 'Edward Carrick' (Edward Craig), film and stage designer, and George Pearson, film director. ] 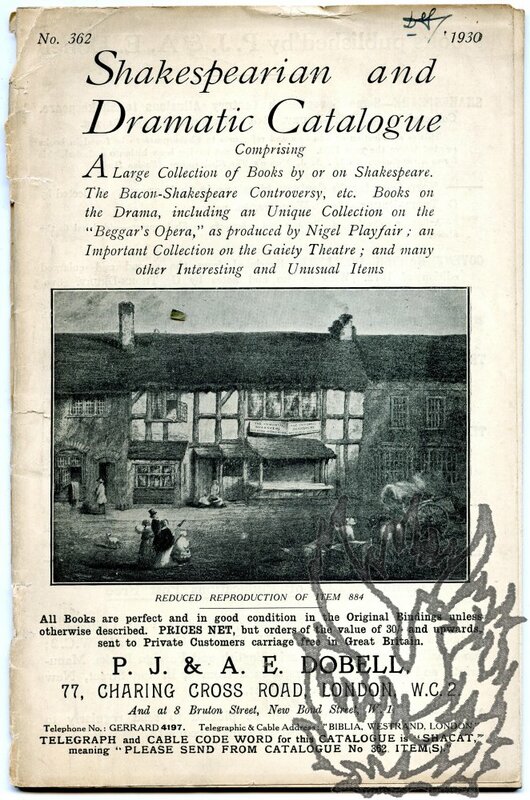 Signed Presentation Copy ('"Edward Carrick" or Edward Craig') of Carrick's book 'Designing for Films' to his mentor English film director George Pearson. The Studio Publications, London & New York. New Edition, 1949. 128pp., 4to. Copiously illustrated with photographs and drawings by the author. 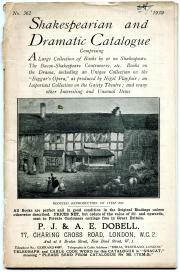 Internally in good condition, lightly-aged, in aged and worn grey binding and dustwrapper. On the front free endpaper Craig writes: 'To G.
[Printed quarto booklet.] Old Janet's Christmas Gift. 17pp. 4to. Three illustrations: one in colour on the cover, and one each in black and white on the back wrap. The last page of text, numbered 17, is on the back inner wrap, followed by a decorative presentation of a biblical text. Covering the back outer cover is a black and white decorative representation of the text 'GLORY TO GOD | ON EARTH PEASE, GOOD WILL TOWARD MEN. | IN THE HIGHEST', engraved by 'T. M.'. In coloured wraps, with attractive cover carrying a large coloured illustration of Old Janet and three others, looking at a donkey. 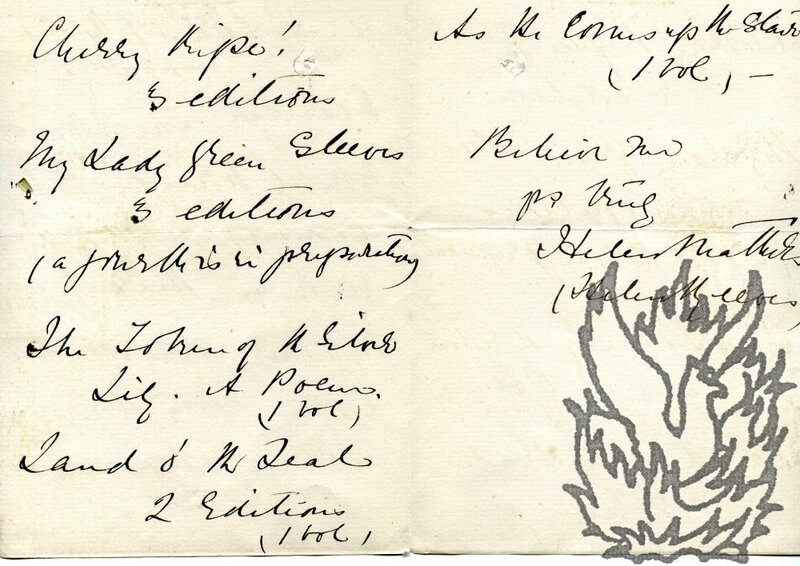 Autograph Letter Signed ('Teddy Craig') from Edward Gordon Craig to Nannie Florence Dryhurst, anarchist, suffragette, giving details of his charges for designing and printing bookplates. With proof of Craig's bookplate for Dryhurst. Letter on letterhead of 17 Sunderland Terrace, London W2. Neither item dated. Letter: 1p., 12mo. On letterhead of 12 Sunderland Terrace, London, printed in orange with orange border. Good, on lightly-aged paper. He states that his daughter Nelly (1904-1975) has given him her bookplate block 'to get printed for you'. He quotes prices for 100 and 300 prints, 'only to old friends so please dont tell anyone else!! If you will just let me have a P.C I will get them done in two days.' Nelly has also told him that Mrs Dryhurst's husband Alfred Robert Dryhurst (1859-1949) 'wanted to know my price for a bookplate (but perhaps she got that wrong) anyhow I generally charge £10. 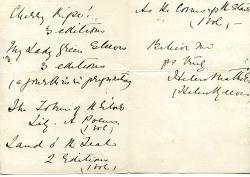 1 December 1879; on letterhead of 6 Grosvenor Street, [London] W.
12mo, 3 pp. Bifolium. Spike hole through both leaves, not affecting text. Fair, on aged paper. She states that 'The story would be ready to commence the 2nd. week in March.' She then gives a list of her five 'other works besides Comin' thro the Rye'. The first two in the list are said to have passed through '3 editions', and of the second in the list 'a further is in preparation'.